Bake everyone's favorite pie! Perfect size for individual fruit pies, pumpkin pies, pot pies, shepherd’s pie, individual cakes and desserts, mini cobblers, mini quiches and single serving recipes! Great for portion controlling and make-ahead meals for school, work or home. Durable steel construction with nonstick coating provides easy release and quick cleaning. Hand washing recommended. 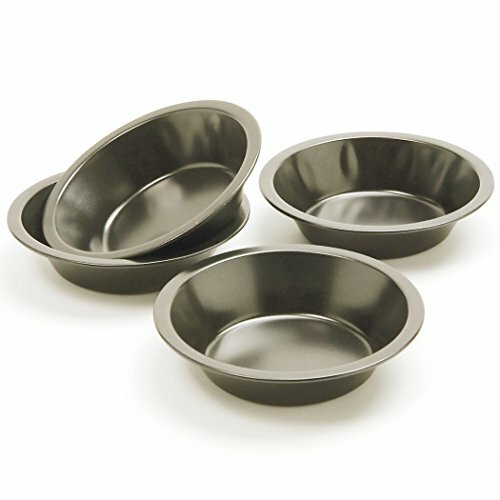 Perfect size for individual fruit pies, pumpkin pies, pot pies, shepherd's pie, individual cakes and desserts, mini cobblers, mini quiches and single serving recipes! Great for portion controlling and make-ahead meals for school, work or home. Durable steel construction with nonstick coating provides easy release and quick cleaning. DOBI 9" Pie Pans (30 Pack) - Disposable Aluminum Foil Pie Plates, Standard Size, 9" x 1.25"